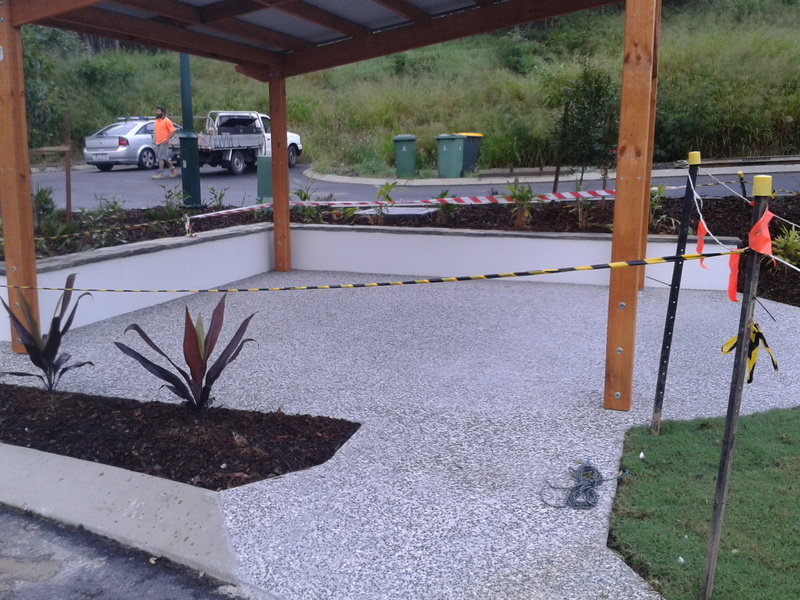 With over 20 Years experience in all aspects of concrete placement and finishin g you can rest assured that your next concreting project will be handled by the professionals. So what does a concreter do? We offer many services when it comes to concreting. There are many types, variations and styles of concrete these days and options are limited only by your imagination (and budget of course). we have over 20 years experience in concrete construction and have completed numerious jobs streaching from the Gold Coast to the Sunshine Coast. Please check out our photo gallery to see the quality of work produced by our concreters. Ask your concreter to supply photos of completed jobs. Although there are many concreters around there are differences. Some may only work in hi-rise construction (floor layers) some are more involved to decrotavie solutions such as exposed aggregates, colored concrete, stamped concrete, cocncrete staining, stencil or covacrete. Exposed Aggregate Driveways can enhance the look and feel of your entire home with a brand new exposed aggregate driveway. Sealing exposed driveways is recommended. We will only quote sealing of driveways if requested and do recommend that it be done either by the home owner or by us. Sealing your driveway will not only make it last longer it will also enhance the look of the driveway, giving it that "wet look". It will also offer protection of the concrete from the elements as well as oil spills and staining. Please look through our exposed concrete gallery pictures to see examples of our work. Colored concrete is another popular choice which can be done a couple of different ways. The first and best option is to have the color pre mixed at the concrete plant. This option is more expensive but it will last. Option two is to trowel the color (oxide) into the top layer of the plain concrete. This option is cheaper but would recommend sealing afterwards. Please look through our colored concrete gallery pictures to see examples of our work. Deciding to go with a plain driveway (grey broom finish) is a popular option. And usually a lot cheaper. A Plain Driveway can be left to cure and later covacreted if needed or wanted. Please look through our plain concrete gallery pictures to see examples of our work.